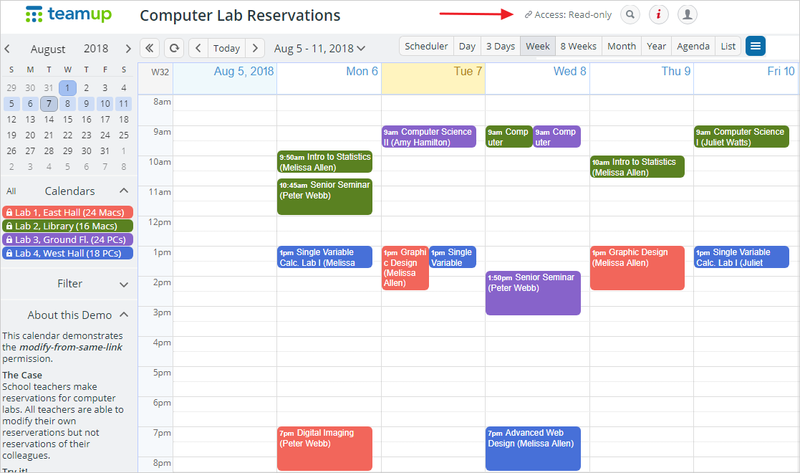 A common usage of a Teamup Calendar is allowing clients, a group of users, or members of an organization or community to schedule appointments or add events to a calendar directly. Allowing users to add directly to the calendar prevents the need for multiple emails and conversations. Teamup’s flexible method of sharing calendars via links with customized access permissions makes this calendar use possible. See the full list of permission types and how to share. A school or university may want students to sign themselves up for one on one discussions with teachers. A beauty salon or hairdresser may want to allow clients to create their own appointments online. In a team environment, members could request meetings on the calendar. A charity program may want volunteers to sign themselves up for shifts or events. A department in a large corporation or a small business may need to allow staff to request time off. The above scenarios are straight-forward enough with a Teamup Calendar. As a calendar admin, you need some sort of control over the process. This is where the Add-only’ and Add-only, no details permissions come in handy. You can essentially use a Teamup Calendar as a pending and approval system. 1. Add a sub-calendar solely for event submissions, meeting requests, appointments, or shift sign-ups . It could be called Submit Event or Pending Appointments or something more applicable. 2. Create a link for the sub-calendar. Customize the link to share only the Submit Event/Pending Appointments calendar with the Add-only or the Add-only, no-details permission. This permission means that users with this link will only be able to add events to the event submissions calendar, and nothing more. They will be able edit any events they create within the same 30 minutes. Note that the Add-only, no-details permission does not allow the user to see the details in the other events. They will merely see other slots as Reserved. If you want to allow the requester also to be able to modify what he or she submitted earlier, you could create a link just for that specific user and assign it with the Modify-from-same-link permission. In the image above, with the Add-only, no Details permission link, a person can only add events and modify them within the same 30-minute time window. Other events that have been previously added show as Reserved. An alternate approach would be to additionally share the sub-calendars (with read-only permission) that hold the fixed events or appointments. That way, the person could see when there are time slots available for adding their own event. An add-only link allows users to add events (only) to all sub-calendars. This would be applicable when there is no approval necessary. 3. View and approve events that have been submitted. The calendar administrator can view events that have been added, either via looking at the calendar, or by receiving an automated email notification. 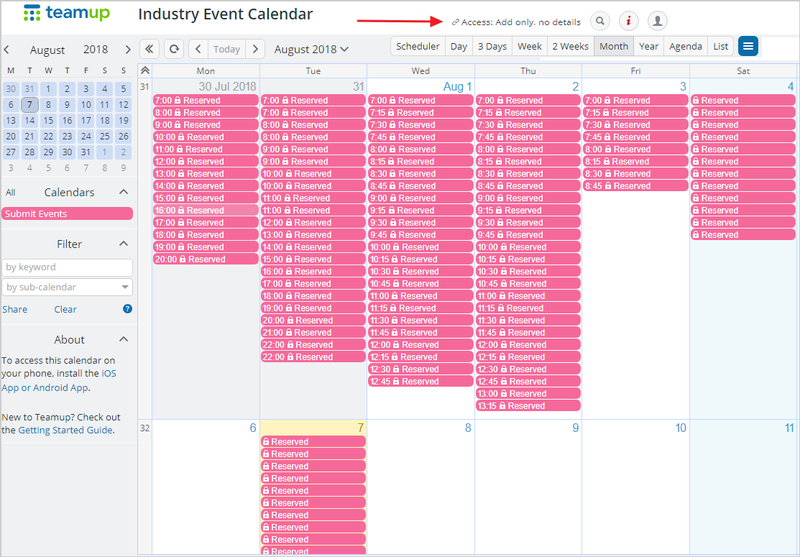 The calendar administrator can see all fixed events, plus events that have been added to the Submit Event sub-calendar. Should the administrator approve the event, he or she can then move the event from the Submit Event sub-calendar to the appropriate sub-calendar for approved events and appointments. Try a Live Demo here: make sure to click the Submit Events link in the About box on the left. To see how this calendar is configured, go to Settings > Sharing to view the link. This process, while it requires some initial set-up, can create a much simpler and faster workflow. You can eliminate multiple email conversations, queries, phone calls, messages, and back-and-forth conversations about event details. When users can enter the information directly into the calendar themselves, everyone saves time.